SNES An American Tail: Fievel Goes West (USA) in 17:10.0 by WarHippy. 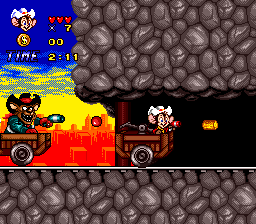 An American Tail: Fievel Runs Right Goes West is a game about Fievel Mouskewitz and his family attempting to move to the right Wild West. In order to make their travels easier they board a train, but Fievel gets left behind trying to run after it. Now whether it's rocks, cacti, or bad guys he must overcome each obstacle in his pursuit of running right.